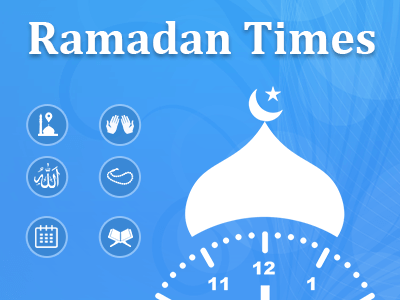 Ramadan Times is very useful tool that allow to follow your daily Namaz schedule properly during Ramadan 2018 and after that too. This is an all in one muslim application containing 11 awesome features such as: Islamic Prayer Times, Qibla Compass, Islamic Calendar or Hijri Calendar, Al Quran, Duas, Tasbih Counter, 99 Names of Allah, Mosque Finder, Ramadan Times (Sehri and Iftar Timing), Zakat Calculator and also Kalima. – Displays 5 Muslim Prayer Times: Fajr, Dhuhr, Asr, Maghrib and Isha along with Sunrise timing. – Set Waktu Salat Alarm with azan. – Monthly Prayer Times shows Salat times of entire month. – Different Calculation Method, Method Hanfi/Shafi and Coordinated Universal time. – Also provides support for Daylight Savings Time for salat time calculation. – This is a useful application that will keep you updated on the correct prayer timings throughout the month. – Displays daily Sehri/Iftar time to start and end fasting for Ramzan. – Full month’s Imsak, suhoor and Iftar time in table format for Ramadan 2018. – Calendar View that showing Hijri Calendar and providing equivalent English Calendar Dates. – Muslim Holidays list provide for current Islamic year in the Hijri Calendar. – Find Kaaba Direction from the any part of the world. – Display distance to Mecca from you current location. – Offline Islamic Compass Use. – Complete Quran with Arabic and English language. – Shows all 132 Duas in Arabic with their meaning provided. – Display Allah Names with English Meaning. – Asmaul Husna with mp3 audio sounds for all names. – The main purpose of Zakat calculator is to enable Muslims to find out how much Zakat they have to pay after deducting their liabilities and personal requirements from total amount and property they posses. – This App helps the user who gives the zakat and they can calculate the zakat(Nisab) in the right way. – Tasbih Countert to recite name of allah. – Select the type of Tasbih such as Verse/Surah, Durood, Allah’s Name and Kalima. – Manage past history to see how much Tasbih you recited. – Find near by masjids/mosques around your location using this app. – Show accurate distance and direction from mosque in cool looking UI.